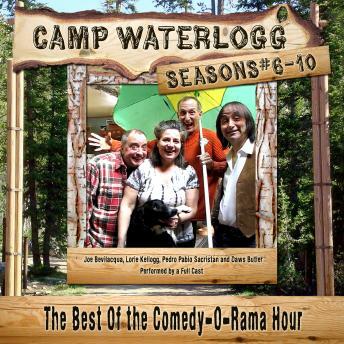 Part improvisation, part audio cartoon, The Camp Waterlogg Chronicles, Seasons 6-10 is a five-volume collection of the successful comedy show created by two radio-theater veterans. Each volume contains six one-hour segments of the comic misadventures of Sergeant Lefty, Olive Pitts, Ellis the Boatkeeper, Squeaky Lkie, Stinky Peter, Mrs. Terwilliger, and all the wacky denizens of Camp Waterlogg, the dilapidated camp for kids in the Catskills. The creation of husband and wife team Joe Bevilacqua (Joe Bev) and Lorie Kellogg, theses episodes are part of the Comedy-O-Rama Hour, a successful radio theater show on Sirius XM Radio.